I am pleased that the "Direct Conversion of Solar Energy: Renewables and More" Flagship Initiative is taking center stage. This is a major leap forward for a sustainable energy economy and environment technology. The Initiative will allow to address the need for the 80+% fuels on the world energy consumption 1. Europe will lead by good example 2. In addition, alternative production methods for the chemical industry may emerge from the Initiative. One alternative for the "Direct Conversion" is by the use of photoelectrochemical cells (PEC) 3. For example, waste water or humidity from the ambient, together with CO2 from the ambient or from concentrated sources, can be directly converted into hydrocarbons which can be used either as fuel or as valuable chemicals. These PEC reactors certainly also can operate without CO2 and then just produce pure hydrogen, which, too, is a valuable fuel for fuel cells or a precursor for the chemical industry. The energy necessary for driving the chemical reactions in the reactor is directly taken from the sunlight. The design of the PEC reactors is open for various alternatives. They can be made from entirely inorganic components, such as conventional semiconductors or metal oxide semiconductors and electrocatalysts. Figure: Photoelectrochemical reactor with 10cm x 10cm active area photoelectrode for solar hydrogen production designed by Empa. There is a promising new branch of artificial photosynthesis arising where the functional components of PEC reactors are gradually replaced or enhanced by bio-organic materials 4. This includes light harvesting antenna proteins, metaloproteins such as hydrogenases and also models of the oxygen evolving complex in Photosystem II. These components can be expressed from bacteria and algae, some of them genetically engineered so that, for example, covalent attachment on inorganic electrode supports is facilitated 5. This is done with the aim to better match the electronic structure of the bioelectric interface for the optimized charge transfer and charge carrier dynamics. Some researchers even go as far and employ entire living cells or biofilms in such reactors. It is worthwhile to mention that there might be a conceptual and design principle synergy because some researchers are using the same principle for bio fuel cells, which are also equipped with living cells 6-9. The advantage of employing living cells with bioelectric interfaces is that these have regenerating properties. While cells are dying, they are reproducing naturally, and their population dynamics can be controlled externally to warrant that they run in the bio PEC reactor as designed. These solar fuel production systems can be run entirely independent, i.e. decentralized 10, but they can be joined together to a fuel network, be it H2 or hydrocarbon. 1. Braun, A.; Gaillard, N.; Miller, E. L.; Wang, H., Introduction. Journal of Materials Research 2016, 31 (11), 1545-1546. 2. Thapper, A.; Styring, S.; Saracco, G.; Rutherford, A. W.; Robert, B.; Magnuson, A.; Lubitz, W.; Llobet, A.; Kurz, P.; Holzwarth, A.; Fiechter, S.; de Groot, H.; Campagna, S.; Braun, A.; Bercegol, H.; Artero, V., Artificial Photosynthesis for Solar Fuels - an Evolving Research Field within AMPEA, a Joint Programme of the European Energy Research Alliance. Green 2013, 3 (1), 43-57. 3. Hu, Y.; Bora, D. K.; Boudoire, F.; Häussler, F.; Graetzel, M.; Constable, E. C.; Braun, A., A dip coating process for large area silicon-doped high performance hematite photoanodes. Journal of Renewable and Sustainable Energy 2013, 5 (4), 043109. 4. Braun, A.; Boudoire, F.; Bora, D. K.; Faccio, G.; Hu, Y.; Kroll, A.; Mun, B. S.; Wilson, S. T., Biological components and bioelectronic interfaces of water splitting photoelectrodes for solar hydrogen production. Chemistry - A European Journal 2014, 21 (11), 4188-4199. 5. Ihssen, J.; Braun, A.; Faccio, G.; Gajda-Schrantz, K.; Thony-Meyer, L., Light harvesting proteins for solar fuel generation in bioengineered photoelectrochemical cells. Curr Protein Pept Sci 2014, 15 (4), 374-84. 6. Kim, D.; Sakimoto, K. K.; Hong, D.; Yang, P., Artificial photosynthesis for sustainable fuel and chemical production. Angew Chem Int Ed Engl 2015, 54 (11), 3259-66. 7. Liu, C.; Gallagher, J. J.; Sakimoto, K. K.; Nichols, E. M.; Chang, C. J.; Chang, M. C.; Yang, P., Nanowire-bacteria hybrids for unassisted solar carbon dioxide fixation to value-added chemicals. Nano Lett 2015, 15 (5), 3634-9. 8. Nichols, E. M.; Gallagher, J. J.; Liu, C.; Su, Y.; Resasco, J.; Yu, Y.; Sun, Y.; Yang, P.; Chang, M. C.; Chang, C. J., Hybrid bioinorganic approach to solar-to-chemical conversion. Proc Natl Acad Sci U S A 2015, 112 (37), 11461-6. 9. Sakimoto, K. K.; Wong, A. B.; Yang, P., Self-photosensitization of nonphotosynthetic bacteria for solar-to-chemical production. Science 2016, 351 (6268), 74-7. 10. Braun, A.; Diale, M. M.; Maabong, K. D.; Toth, R. In Safe And Decentralised Hydrogen Fuel Production And Storage For Residential Building And Mobility Applications, 6th International Disaster and Risk Conference 2016 - "Integrative Risk Management - towards resilient cities", Davos, Switzerland, 28 August - 01 September 2016; Stal, M.; Sigrist, D.; Wahlen, S.; Portmann, J.; Glover, J.; Bernabe, N.; Vitry, D. M. d.; Ammann, W. J., Eds. Global Risk Forum GRF Davos, Davos, Switzerland: Davos, Switzerland, 2016; pp 102-105. The "Direct Conversion of Solar Energy: Renewables and More" FET Flagship Initiative would fit in providing solar hydrogen for that purpose. I am very pleased that the "Direct Conversion of Solar Energy: Renewables and More" Initiative is now taking center stage. The Initiative will allow to address the need for the 80+% fuels on the world energy consumption [Braun 2016b]; Europe will lead by good example [Thapper 2013]. In addition, alternative production methods for the chemical industry may emerge from the Initiative. One alternative for the "Direct Conversion" is by the use of photoelectrochemical cells (PEC)[Hu 2013]. For example, waste water or humidity from the ambient, together with CO2 from the ambient or from concentrated sources, can be directly converted into hydrocarbons which can be used either as fuel or as valuable chemicals. These PEC reactors certainly also can operate without CO2 and then just produce pure hydrogen, which, too, is a valuable fuel for fuel cells or a precursor for the chemical industry. The energy necessary for driving the chemical reactions in the reactor is directly taken from the sunlight. 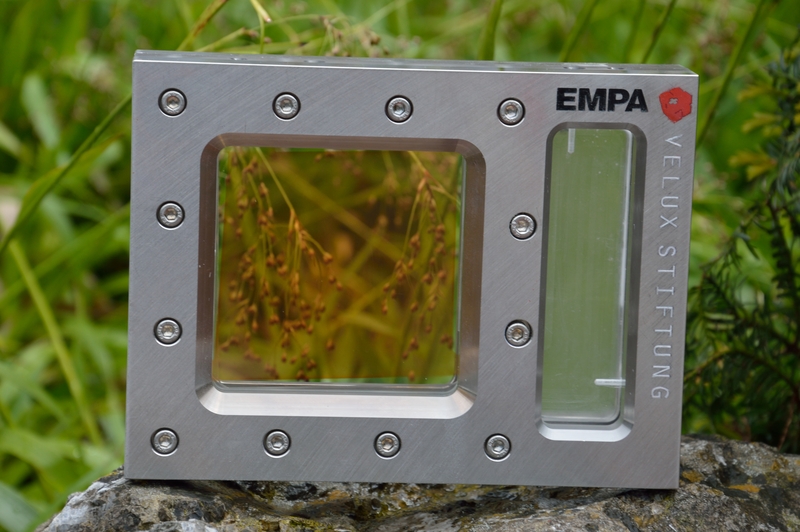 Photoelectrochemical reactor with 10cm x 10cm active area photoelectrode for solar hydrogen production designed by Empa. There is a promising new branch of artificial photosynthesis arising where the functional components of PEC reactors are gradually replaced or enhanced by bio-organic materials [Braun 2015]. This includes light harvesting antenna proteins, metaloproteins such as hydrogenases and also models of the oxygen evolving complex in Photosystem II. These components can be expressed from bacteria and algae, some of them genetically engineered so that, for example, covalent attachment on inorganic electrode supports is facilitated [Ihssen 2014]. This is done with the aim to better match the electronic structure of the bioelectric interface for the optimized charge transfer and charge carrier dynamics. Some researchers even go as far and employ entire living cells or biofilms in such reactors. It is worthwhile to mention that there might be a conceptual and design principle synergy because some researchers are using the same principle for bio fuel cells, which are also equipped with living cells [Kim 2015, Liu 2015, Nichols 2015, Sakimoto 2016]. These solar fuel production systems can be run entirely independent, i.e. decentralized [Braun 2016a], but they can be joined together to a fuel network, be it H2 or hydrocarbon. [Braun 2015] Braun A, Boudoire F, Bora DK, Faccio G, Hu Y, Kroll A, Mun BS, Wilson ST: Biological components and bioelectronic interfaces of water splitting photoelectrodes for solar hydrogen production. Chemistry 2015, 21:4188-4199. [Braun 2016a] Braun A, Diale MM, Maabong KD, Toth R: Safe And Decentralised Hydrogen Fuel Production And Storage For Residential Building And Mobility Applications. In 6th International Disaster and Risk Conference 2016 - "Integrative Risk Management - towards resilient cities"; 28 August - 01 September 2016; Davos, Switzerland. Edited by Stal M, Sigrist D, Wahlen S, Portmann J, Glover J, Bernabe N, Vitry DMD, Ammann WJ. Global Risk Forum GRF Davos, Davos, Switzerland; 2016a: 102-105. [Braun 2016b] Braun A, Gaillard N, Miller EL, Wang H: Introduction. Journal of Materials Research 2016b, 31:1545-1546. [Hu 2013] Hu Y, Bora DK, Boudoire F, HäUssler F, Graetzel M, Constable EC, Braun A: A dip coating process for large area silicon-doped high performance hematite photoanodes. Journal of Renewable and Sustainable Energy 2013, 5:043109. [Ihssen 2014] Ihssen J, Braun A, Faccio G, Gajda-Schrantz K, Thony-Meyer L: Light harvesting proteins for solar fuel generation in bioengineered photoelectrochemical cells. Curr Protein Pept Sci 2014, 15:374-384. [Kim 2015] Kim D, Sakimoto KK, Hong D, Yang P: Artificial photosynthesis for sustainable fuel and chemical production. Angew Chem Int Ed Engl 2015, 54:3259-3266. [Liu 2015] Liu C, Gallagher JJ, Sakimoto KK, Nichols EM, Chang CJ, Chang MC, Yang P: Nanowire-bacteria hybrids for unassisted solar carbon dioxide fixation to value-added chemicals. Nano Lett 2015, 15:3634-3639. [Nichols 2015] Nichols EM, Gallagher JJ, Liu C, Su Y, Resasco J, Yu Y, Sun Y, Yang P, Chang MC, Chang CJ: Hybrid bioinorganic approach to solar-to-chemical conversion. Proc Natl Acad Sci U S A 2015, 112:11461-11466. [Sakimoto 2016] Sakimoto KK, Wong AB, Yang P: Self-photosensitization of nonphotosynthetic bacteria for solar-to-chemical production. Science 2016, 351:74-77. [Thapper 2013] Thapper A, Styring S, Saracco G, Rutherford AW, Robert B, Magnuson A, Lubitz W, Llobet A, Kurz P, Holzwarth A, Fiechter S, De Groot H, Campagna S, Braun A, Bercegol H, Artero V: Artificial Photosynthesis for Solar Fuels - an Evolving Research Field within AMPEA, a Joint Programme of the European Energy Research Alliance. Green 2013, 3:43-57.